Thursday afternoon and time for the website's yearly update... Really folks, a LOT has been happening in Kudra land. Aside from gigs (Hard's Corner has proven to be a very Kudra friendly venue) there is new recording happening. Kudra's management cut a sweet deal with the world renown Emily’s Studio recording studio. There is a link to that demo below. There will be a full new album coming real soon. Kudra now has a tumblr page. There has been talk, a lot of talk... About a new website... Perhaps 2014 will produce many wondrous things. While your at it, like us on facebook. The future of all humanity is counting on it. But seriously all the bands rocked at the Lilly pad and it was a pleasure to share the stage with you all. There should be more pictures later in the week. More gigs on the way as well. When is the next album do out? Right after we sell some more of the current album... Stay tuned. Retail news- We are now for sale on CD Baby and Itunes. Amazon should be a few days away... Behold the power of the internet. Website News- The images page is back up... now you can spend countless hours looking at us... Keep it clean folks, this is a family site... There is so much changing here these days that even I don't know what is going on. I suppose that is not a change though. Be sure to check out our video from Dewey's. More video to come, I promise. Video News- A little elf filmed us at Dewey;s. (Thanks Jenn. (Elves should not be confused with gnomes... Gnomes steel underwear for profit. Remember stage one-steal underwear, stage two-??? stage three-profit... Austrian economics to be sure. I have never known Justin's wife to steal underwear, but what do I know.)) You can see that video on youtube here. Still O+ther Music news- Clips from Finding Eleven up on the music page. More music to come soon. Show News-Kudra played Deweys last Saturday with Tromitized, This Hostile Existence and Kali Ma. Thanks to Brian of Tromitized for the gig, you guys rocked. It was a fun night, we may be back there soon. An interesting room that seems very original friendly. Kudra played some new material including Eight Sisters... Wha't that you say? Your supposed to post the gigs on your site before you play them? Well tell our webmaster th... Umm, never mind that... Really the web updates have been lacking, but that is something that should improve. More Show News-Kudra is booked for a battle of the bands at The Lillie Pad (Upstairs at Toads.) Saturday March 9th, $8 in advance $10 at the door. More on this as the details finalize. Wow, it's like we are a real band again or something. Music News- The rumors are true, you should be able to buy Kudra on itunes soon. Whats that you say, every garage band in the land is already on itunes? Well tell our webmaster that... Nevermind... But really files are uploading while this is being typed so this may actually happen this time. Stay tuned. Suffice to say that it is here. Below is some art work off the new album which just arrived. Heavens knows what effect this will have on society at large. There are rumors of a CD release party radio campaign... You know the usual. There is even talk of... Wait for it. Selling songs on Itunes. I know, I know, there have always been a lot of rumors on the Kudra home front but really this time there really is something to them. I know I know I always say that but this time I really mean it. Happy new year. I know I have been busy and it really did take too long for this site to come back up but you have to understand, with the holidays, alien abductions and getting the album finished really there was not as much time as you would have thought... Ok, I was lazy as well but I try not to mention that because then people bring it up at band practice. Speaking of the album... Props go out to Ray Morant of Monster-lab Studios for putting up with us for constant hours of recording and Tyler Bird of The Fire Below Studios for similar things during mastering. (I hear there is a little elf working on making you two some sort of commemorative plack or something. Something about recording in your bathroom.) Thanks guys the tunes sound great. 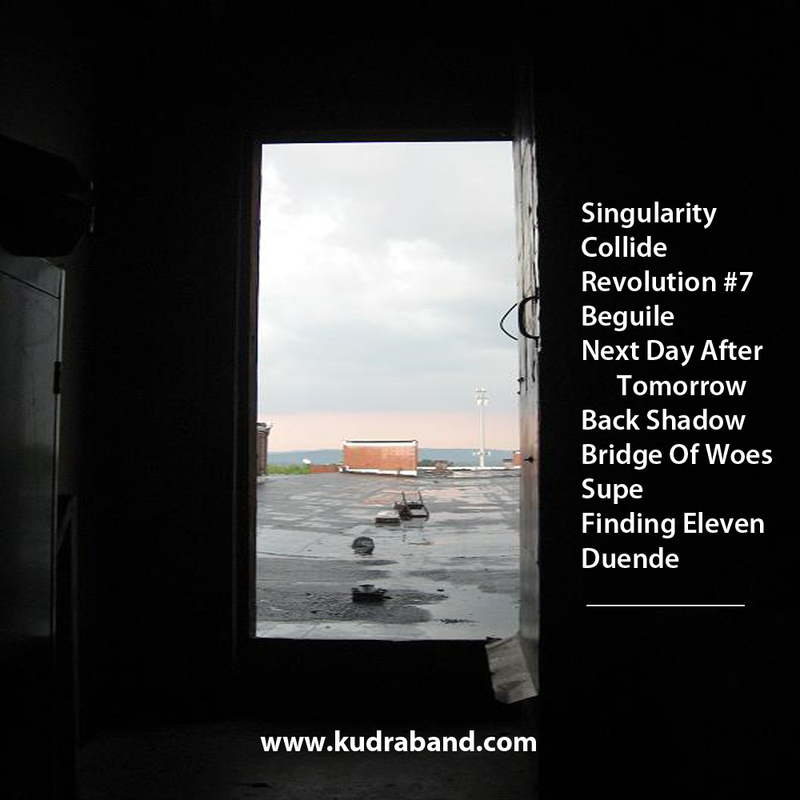 For all you Kudra fans out there, there soon with be CDs. Not to mention online distribution. With any luck now that the holidays (and of course barring any further abductions) this site should see regular updates and further content. Oh yeah, Kudra is on facebook. Sign on in and be our friend. It will have enormous significant value to the universe as a whole. I know what your thinking... I know I know... Why hasn't this idiot posted any song clips yet... Some of the more paranoid types probably think that I get some sort of twisted pleasure from depriving western society from having our new tunes. Others may tremble at the mere thought of what one more Kudra album would to do society in general. Many believe that we fear the coercive methods that the big labels would use on us to sign with them once they heard the new material. These all are perfectly sound reasons for us to not to put clips up here, and when I say us I mean me. All of these reasons are not correct. The real reason that I have not posted clips is that I was abducted by aliens again last week and it always really messes with my schedule. Hopefully things are back to what I call normal. Right click the clips below to download. We would seem to be knee deep mixing an album and to everyone's surprise no one is hearing the obligatory there is not enough kick drum or “wheres the bass?” Props go out to Ray Morant of Monsterlab Recording fame. If he actually survives the mixing process of this album I plan to personally buy him a beer. For those of you chomping at the bit for down loads, there are links to partial clips below. Mind you these are not final yet. And for our beta testers (and you know who you are) there will be full song versions coming your way very very soon... That is if you do not already have them. If we survive this process, you might be able to catch us at a gig in the not too distant future. I know the big labels are all antsy to get in touch with us an all, so they can email us at joe at this domain dot com. Or something. Now back to your regularly scheduled programing... Ready... Set... DO IT!!!!! The studio went well last night. There has been controversy in the past over percussion tracks for our previous albums with the PETA protests and all but not this time! Neither PETA or anyone else will stand in our way this time, as long as someone doesn't quit the band again... I suppose it may be my turn and all by now... Seriously, the new tunes really need to be heard and a select set of beta testers are busily testing them as I type this. Clips will be up here shortly as well as a more complete site... Is that Completion I am talking about? Stay tuned and find out. I know, I know, there has been a lot of talk. People have been saying this and that, but all of those viscous rumors have actually turned out to be true. Kudra is back together. I know you all are reeling from that news but as it turns out it's worse than just that. Fasten your safety belt and extinguish all smoking materials before you hear this next bit of news... A new full length album (for a Kudra album that means somewhere in the neighborhood of an hour of music) has been recorded and is set to begin mixing on October 2nd. (And yes that means we have a full hour of material to mix as well.) Props go out to Ray Morant of Monster-lab studios, he has my sympathy for the upcoming mixing process, this one should be a monster.